The most striking element of Geneforge’s writing is how the factions are handled. Few AAA games manage the nuance Vogel writes into this very basic-looking game’s major sides. The sects are characters in their own rights. The little secrets you can uncover — or overlook — add life to the whole work. This entry was posted in Gaming and tagged games, geneforge, let's play on January 22, 2018 by Erica Carson. Let’s Play Geneforge: Part 4B – Everywhere I Go, I Must Kill! East of Vakkiri is the road to Watchhill, where Ellhrah’s fort is supposed to be. You’re not sure what to expect from a servile fort. It must be another Shaper ruin; none of the buildings you saw in Vakkiri were of servile make. You’re not even sure what a servile designed and built structure would actually look like. The Vakkiri serviles all claimed abandoned Shaper buildings and have done their best to keep them from falling entirely to ruin. In a way, it’s a form of sincere dedication to the Shapers. You doubt the Awakened want to hear that, though. You quickly find rogue thahds patrolling the road. Fortunately, they’re patrolling one by one. Careful, methodical movement allows you to pick them off one by one without being seen and without any thahds ambushing you from behind. No serviles patrol these roads. You find a sign that reads “Ellhrah’s Fort – North,” but you pass it by in favor of the main road. This entry was posted in Gaming and tagged games, geneforge, let's play on January 21, 2018 by Erica Carson. Let’s Play Geneforge: Part 4A – Everywhere I Go, I Must Kill! Welcome back to Let’s Play Geneforge! This entry was posted in Gaming and tagged games, geneforge, let's play on January 18, 2018 by Erica Carson. Let’s Play Geneforge: Part 3 – What Is a Servile? A Miserable Pile of Secrets. Here’s what Geneforge’s loading screen looks like if you wait a few seconds before selecting an option. Creations start coming out of the shaping platform on the lower left and they march across your screen. It’s pretty cute, actually. This entry was posted in Gaming and tagged games, geneforge, let's play on January 16, 2018 by Erica Carson. This is Geneforge’s overland map screen. The game is divided up into areas that are themselves divided up into faction-controlled regions. The area we just left, Crumbling Docks, is marked as green, but the area we’re moving to, Abandoned Vale, is red. 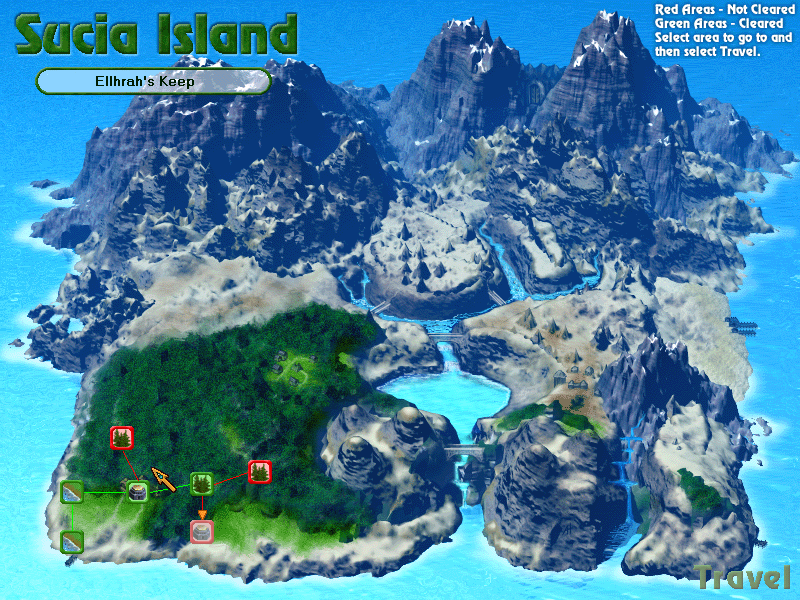 Green areas have been cleared and can be skipped over on the map screen. Red areas haven’t been cleared. Almost all areas can be cleared by completing an objective. Sometimes that is discovering one or more exits, killing a particular foe, or fulfilling a special condition. The map system does tend to funnel you along a level-appropriate path at first, but you’ll find options quickly open up and you can wind up in over your head very easily. This entry was posted in Gaming and tagged games, geneforge, let's play on January 14, 2018 by Erica Carson. You won’t enjoy your stay. The first thing we actually do in Geneforge, after selecting New Game, is create our character. 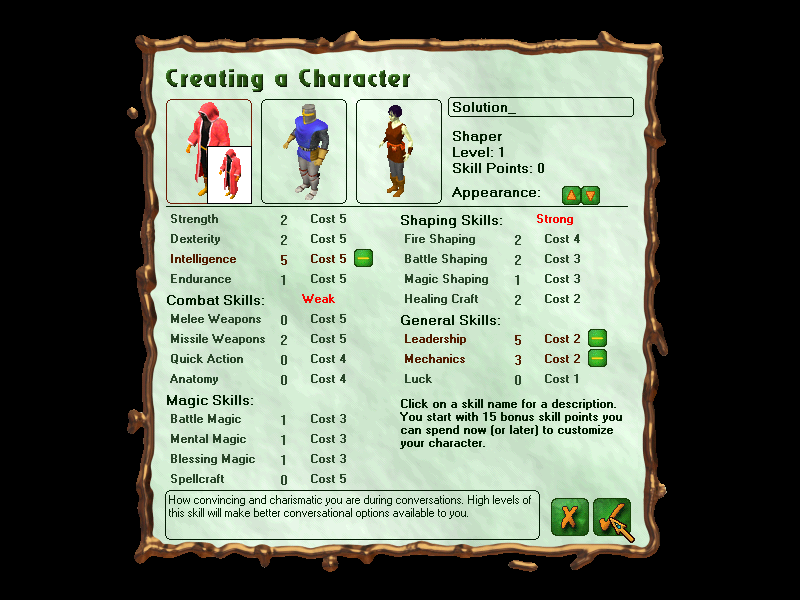 This game is a little different from most tactical turn-based RPGs; there’s only one player character, and their characterization is based on how you choose to interact with the various in-game factions. You have 3 classes to choose from: the Shaper, the Guardian, and the Agent. This LP will follow the Shaper character. The narratives don’t divide sharply between the 3 classes, but the story feels more intimate when it applies to someone who regularly meddles with the forces of creation itself. This entry was posted in Gaming and tagged games, geneforge, let's play on January 12, 2018 by Erica Carson. Back in the wilds of November 2016, I began a screenshot narrative let’s play for one of my favorite underrated CRPGs, Geneforge. This is the third edition of the LP, this time tidied up for a more general audience. 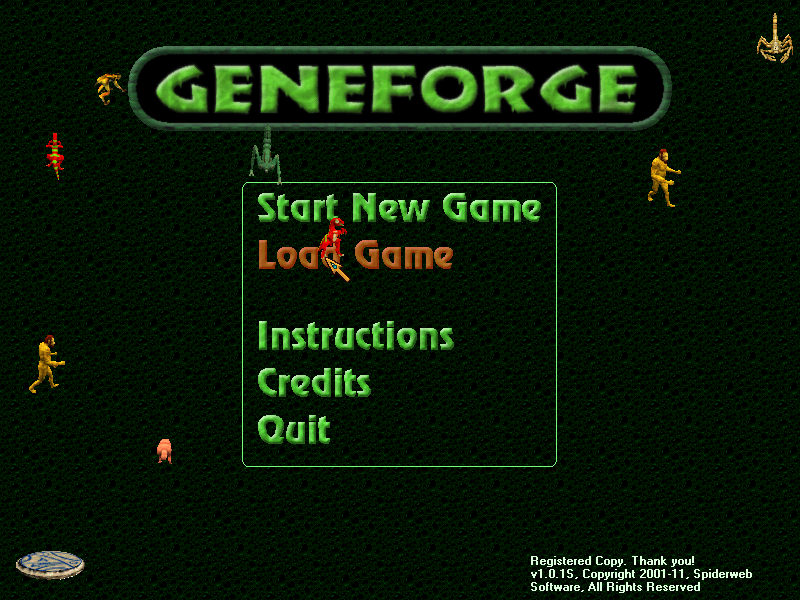 Geneforge is the first of a five-game series developed by Jeff Vogel of Spiderweb Software. The games are all turn-based tactical RPGs on isometric-ish maps. They can get quite challenging even on normal difficulty depending on your playstyle; it’s very easy to be overwhelmed and you’re almost always outmatched. You might know Vogel’s games from the recently completed Avadon trilogy, or from the ongoing re-remake of the Exile games – he has an old school vision that punishes rushing into combat. But Geneforge hasn’t received the remake treatment yet and probably won’t for at least a few more years. The graphics and performance show the game’s age. 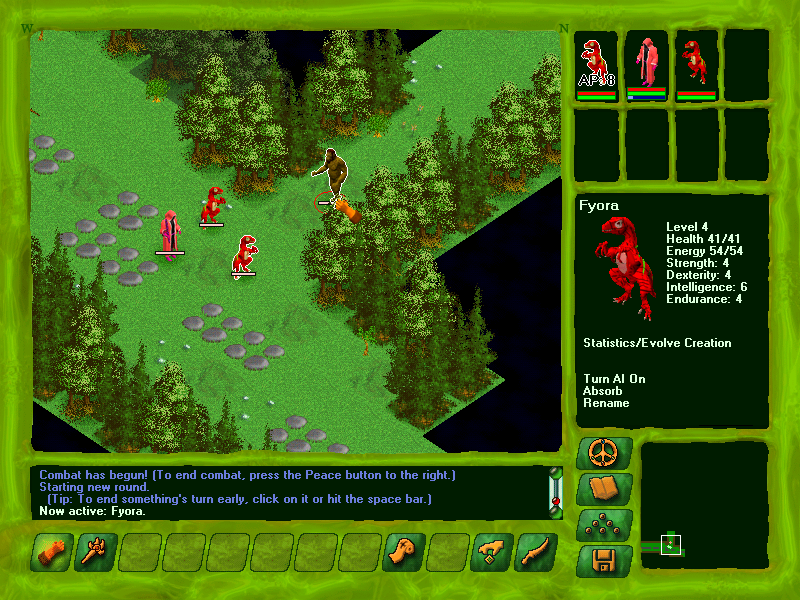 Geneforge was originally released on Mac in 2001, with a PC version in Q1 2002. Performance is grindingly slow, the engine is dated to the Jurassic era, and this indie title lacks a lot of the graphical and musical polish players have come to expect. Graphics and audio have never been Vogel’s focus, so if you come into the games expecting them, you will be disappointed. His focus is gameplay and storytelling, and the latter is where this series really excels. Each of the Geneforge games focuses on pursuing alliances or rivalries with political factions, and as such, you have many, many decisions to make over the course of a playthrough. I can’t promise that I will be able to show all of the possible outcomes, but I can show each of the basic endings. We will be playing as a Shaper; a mage whose training and abilities allow him or her to create and modify life from drought-tolerant wheat to mind-controlling vlish. Of course, we don’t start out with that much power, but I’ll let the game speak for itself. This entry was posted in Gaming and tagged games, geneforge, let's play on January 10, 2018 by Erica Carson.